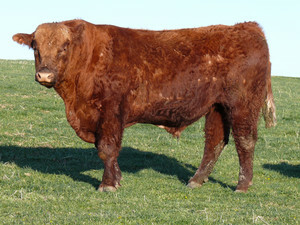 PARADOX is Salers X Red Angus bull whose early progeny record has proven him to be a very consistent calving ease sire. The PARADOX calves are born early and easy and have outstanding subsequent performance. His dam has become one of the most reknowned females in our breeding program. Along with PARADOX, she has produced MAC NATO 78N, hersire for Skinner Ranch of Hall, MT and MAC RADAR 107R, herdsire for Thiel Land and Livestock of Nyssa, OR. RADAR was the 2006 National Reserve Calf Champion Bull. Her 2006 natural calf was MAC SARA 231S who was the $7000 high selling female of the 2006 Salers Supreme sale.